I just got this one today and I really like it. I mean I really like it! This is a well composed rockin blues party. You gotta imagine I listen to a lot of music and a lot of it just plays in the background. This one made me stop and listen. It isn't the next SRV but it is damn great fun! 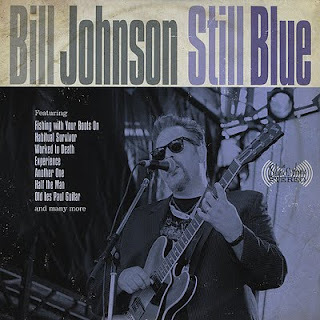 Momentum continues to build for Victoria, BC blues artist Bill Johnson's recent recording Still Blue. Described as his breakout CD, Still Blue has been getting great reviews from critics and fans as well as extensive radio airplay across Canada. On June 30, 2011 BreakOut West announced The 2011 Western Canadian Music Awards Nominees including Still Blue for Blues Recording of the Year. A full list of nominees can be found at www.musicnwt.ca. The Blues Underground Network selected Still Blue as one of the top picks for July 2011, including a five-star review by John Vermilyea. "I am forty six years old, I believe all you need is love, and I'm still blue."